Brave New World is a novel by Aldous Huxley, published by Chatto & Windus in 1932. Aldous Huxley wrote Brave New World at his house in Sanary-sur-Mer, France in 1931. The idea for the novel started as a parody or revolt against H. G. Wells’ utopian narratives that were popular at the time. Based on Huxley’s letters he probably started writing in April or early May but would overhaul the work between May and August. Rather than a revolt or parody of Wells, the book became focused on an anti-utopia or dystopia more like the one found in We by Yevgeny Zamgatin (which Huxley publicly denied having read despite mentioning it in a private letter). It was completed by August 24th, 1931. 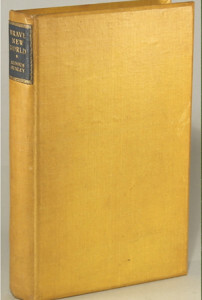 Chatto & Windus (who had published Huxley’s previous novels) printed and released 324 signed copies (314 of which were for sale) of a signed, limited edition version of Brave New World on January 21st, 1932. The first trade edition would follow two weeks later on February 4th.